Christmas is an amazing time for beauty lovers, with virtually every brand bringing out exciting special editions, collector-worthy make up palettes, and handy gift sets that are perfect as presents for friends and family. 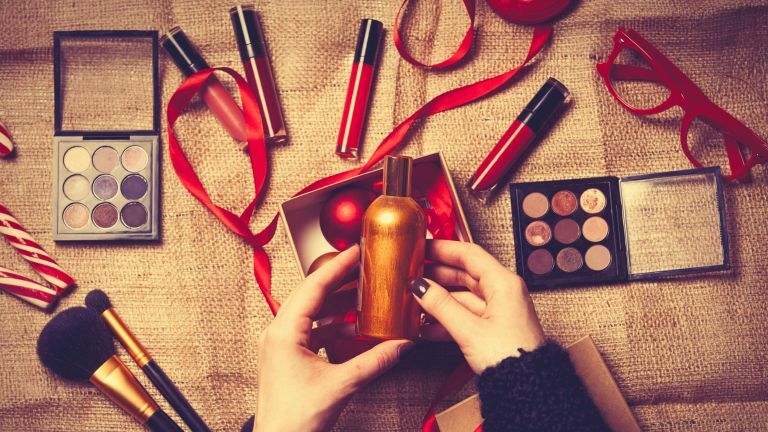 From bath and body products to high-end lipsticks, we guide you through the most attractive of this festive season's beauty gift ideas. Find more gifts and decorations on our dedicated Christmas hub page. And, when you've done reading, why not explore the Real Homes top 50 Christmas gifts, handpicked by our team? There's no time like Christmas for spending a bit of extra time in the bath, pampering limbs tired from work – oh yes, preparing Christmas dinner is work too. Aromatherapy Associates have been a firm favourite with beauty lovers for many years, and no wonder. The strength and effectiveness of their bath oils is second to none, with many different essential oil blends available depending on your needs. The Clear Mind Bath Oil blend is available exclusively at Liberty. Everyone loves a manicure, which makes Christmas a great time to splash on a really nice handcare set. The Art Deco gift set by The Handmade Soap Company is a complete treat for the hands and includes a scrub, a cuticle oil, and a cream. With its sleek Art Deco-inspired packaging, it's refreshingly gender-neutral, too, so perfect as a gift for her or him. If you prefer something cute and playful, the Alpacas Hand Cream Trio by Cath Kidston is as cute and festive as presents get. Manicure sets make great Christmas presents – always useful, and there are lots of nice ones out there. We like The Alice Scott Manicure Set, available at John Lewis. A makeup brush set makes sense; make up brushes do wear down and lose their shape, so it's always a delight to get a brand new set every once in a while. From budget but nice-looking options to professional kits, there is a great deal of choice out there. If you are on a budget, the Make Me Up brush set (above) from Asda's George Home range (above) is hard to beat on value for money: it's pretty, has all the brushes anyone needs, and is very affordable. If you feel like splashing on something luxurious, then look no further than makeup brushes by Charlotte Tilbury (below). The brushes are supremely soft and precise (as you would expect from Tilbury, who is a professional makeup artist), and the design is just delectable. Love this? You might like to indulge in a makeup storage solution, too. The metallic makeup trend shows no signs of going away, and the festive season is particularly accommodating of gold eyeshadows and shimmery highlighters. Fortunately, gone are the days of crazy glitter that will travel all over your face, and most festive shimmery offerings these days create more of a subtle glow than full-on sparkle. Our pick of the festive highlighters is the gorgeous Bobbi Brown Highlighting Powder. It comes in either a rosy or golden shade and instantly refreshes the complexion. Chantecaille have been making understated, top-quality makeup for decades, and the Mermaid Eye Colour range is no exception. The dense metallic eye shadows create a beautiful foil-like effect on the lid – you'll definitely want to keep using these well after Christmas. Shown below in Triton and available at Liberty. There's a red lipstick shade out there for everyone. Heard that one before? And is it true? Well, yes and no. We think it's more of a case of not all red lipsticks being created equal. The Velvet Matte Lip Pencil by Nars (above) is a failsafe option, offering very different red-based shades, from a soft coral to a very purple berry shade. They are super easy to apply, too, with a velvety texture that's impossible not to love. If you had to choose just one red, though, aim for something with the best balance of orange and purple – not too warm and not too cool. We think the Girl Lip Stylo in Lover by Hourglass (below) is pretty close to the perfect red. Available at Liberty. If you know that someone likes a particular brand, or you're just not sure which items they want/need, go all out with a festive gift set. The Beauty Explorer Collection from Espa (above) is full of luxurious goodies for head-to-toe pampering and includes everything from shampoo to face oil. On the more affordable end of the spectrum, The Weekender Set by Cowshed (below) has everything you need for a weekend of self care, including a lovely cherry red nail varnish. As a rule of thumb, when choosing skincare as a gift, go for tried and tested over niche and unheard-of. The products that are around years (in some cases decades) after they launched are still there because they work and have a loyal following. You can't go wrong with the Double Serum Collection from Clarins (above), which includes their bestselling Beauty Flash Balm and the lip-transforming oil. Available at Debenhams. The Elemis skincare range is equally reliable. The festive Cleanse and Glow set (below) includes their bestselling Pro-Collagen cleansing balm and a candle. Perfume is lovely to receive as gift. We love the joyful and summery Terre de Lumiere from L'Occitane (above); it smells of honey and lavender and almonds, and will remind your recipient of afternoons in the sun. If you are buying for a serious perfume lover, then invest into a mini or sample collection from a perfume house – they will love testing the different scents. Our favourite is the Frederic Malle The Essentials Collection (below). If your recipient already has all the perfume they need, and especially if they have a signature scent you know they buy in large volumes, why not give them a fancy glass stopper bottle to decant some of their perfume? This gift works especially well if they don't like sprays; it looks amazing on the dressing table, too. Our pick is the elegant Clear Glass Bottle with Gold Ribs from Maisons du Monde. Not all cosmetic storage bags are created equal, so give them a bag that is high-quality and pretty enough to display on their vanity unit. The Blackbird and Bramble Cosmetic Bag from Thornback & Peel is just the ticket. It's 100 per cent cotton, and costs £22. A perfect gift for those who love the skin-pampering effects of a nice body scrub, but dislike messing around with tubes or jars. The Peppermint and Blue Cornflower Body Scrub by Divine and Handmade comes in bar format, just like a soap, is easy to use, and smells amazing. Available at Wearth London. Yes, lip exfoliants really are a thing. The best way to get rid of dry, chapped lips – much more effective than chapsticks and balms that can make it worse. Our favourite is the gorgeous Nordic Berries Lip Exfoliator by Henne Organics. Works wonders and smells amazing. Available at Naturisimo. The perfect choice for someone you know who really needs to relax and unwind over Christmas (don't we all? ), a massage candle. A relatively novel idea, a massage candle is a candle, scented body oil, or massage oil in one product. The Rose de Mai Massage Candle by Oskia is our firm favourite; it smells out of this world and is deeply nourishing and relaxing for the skin (the wax is completely natural and coconut-oil-based). Simply light it, let a bit of the wax melt, and massage in. No need to worry about it burning their skin, either, as the low melting point of the wax prevents it from getting too hot. This all-natural Alphabet Soap by the Letterologists gets its colour from deep-cleaning charcoal, and has a striking contemporary design that will appeal to men and women. Available at Not On The High Street. Anyone with longer hair likes to experiment with waves and curls, fact. Some like putting a wave through their hair every day, while others only get the curling tongs out for special occasions. Whatever their preference, they'll love the Soft Curl Tong Gift Set by GHD, which includes a paddle brush and handy hair clips. Available at John Lewis. Now, the verdict is still out on semi-precious stone face rollers, and we fully understand that they're a bit too Gwyneth Paltrow for some. But – they look beautiful in the bathroom, they feel pleasantly cool against the skin, and they just seem like they were made to be given as gifts. So, why not? Mind, though, that not all are created equal (ie, if it's under a tenner, it's probably not worth it).